Spring time is usually time to start looking for a new recreational outdoors basketball. Although there is fun in looking up new models and finding the alternatives, I already know which one I will buy. It will be the same one I used last year. 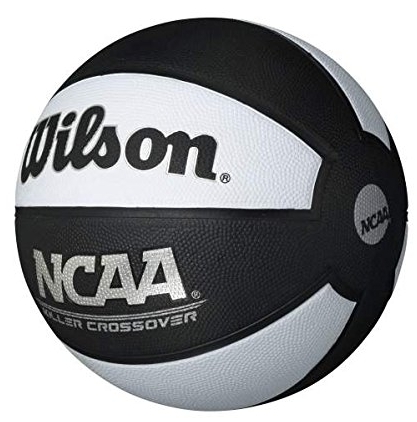 Wilson Killer Crossover basketball really surprised me the balance between the price and quality and I really doubt that I will be able to find a better deal for this summer. The reasons are quite simple: this is an official size 7 ball (29.5″), it offers great grip and control, it can withstand the wear and tear of harsh outdoors courts I play on, and it is really affordable. Wilson really got it dialed in with this model and for those of you who never had the chance to play with it, I will outline a couple of key features. Wilson is renowned for making high-quality basketballs, even when it comes to their cheaper models. This one is covered with Optima rubber cover and it gives you the right amount of grip even when the ball is dusty or wet. This is particularly important since the outdoors courts often are. The channels are wide and offer great control during dribbling and shooting release. One of the things I really like is the design of the ball. I prefer symmetrical panels as they offer great control regardless of the way you palm the ball, especially during layup release. Keep in mind that this is a ball designed for recreational usage and although it performs really well, it cannot actually be compared with professional basketballs. The bounce consistency is one of the main reasons why I will be looking to pick this model up for this year as well. Last year I did an extensive comparison of this model with others could get my hands on and it performed admirably. The ball never bounces in an unexpected way and this proves to be really important for recreational use. I am simply not athletic enough to compensate for the weird bounces off the rim and this ball allows me to predict where the ball is going to end up most of the time. And for my money, that is a probably the best feature of this ball. Wilson is yet to let me down with any of their basketballs, and they keep raising the bar with newer models. There are better outdoors basketballs than this on the market, but I highly doubt you will find one for the price of Wilson NCAA Killer Crossover Basketball.